not quite. Life may have been less hygienic and more fetid than our modern sanitised world, but not irredeemably so. Medieval man possessed a deep knowledge of and a great appreciation for the fragrances of the natural world. Herbs, flowers and perfumes formed a large part of every day existence and were inextricably linked with magic and medicine. The oldest surviving English herbal manuscript is the Saxon Leech Book of Bald written about AD 900-950. Its wisdom formed the foundation of every succeeding English medical treatise. To read the Leech Book is to find vapour and herb baths prescribed for all manner of ailments. It shows how common it was to 'smoke' the sick (animal as well as human) with fragrant woods and plants. Scented garlands decorated homes and bodies. Every herb, every tree and every flower had its own special quality. Rosemary is meant to have been introduced into England by Queen Philippa who received a plant as a gift from her mother the Countess of Hainault. Philippa carried a sprig of rosemary with her at all times. But of all the scents - rose must be the one most associated with the Middle Ages. Trade routes- opened for the first time since the beginning of the Dark Ages - were threatened once more in the 11th century when Seljuk Turks conquered Palestine and closed off free access with the Levant. But not for long. An alliance of European Princes, with eyes on commerce as much as religion, decided to retake Jerusalem. The First Crusade was born. When the Crusaders returned home, they brought with them perfumes beyond imagination, practises hitherto unknown. And rosewater. Bowls of rosewater were soon standing on every noble trestle table for guests to wash their hands after meals - donner à laver. And nice little flirtations often arose during the manus manum lavat where you washed the hands of your dinner companion. The Empress Matilda received a silver peacock encrusted with pearls and gems from France to donner her laver. Philip the Good, Duke of Burgundy owned a statue of a child that peed rosewater. Rose petals floated in the bath every good host was wont to offer to his newly arrived guests. People of the Middle Ages are known to have bathed more often than any of their descendants up to the 19th century. It was common for hosts and guests to share the experience. Portable wooden tubs lined and padded with cloth and cushions are much associated with this period but it was not unknown for royal bathrooms to contain the type of bath we know today, cased in, set on a tiled floor and with bath mats surrounding it. One of the practises hitherto unknown that the Crusaders brought back with them from the Middle East concerned public bath houses. The Stews. Under Richard II there were 18 stews in the Southwark region of London alone. Young boys were often seen running through the streets shouting out that the water was now hot. The baths were open for business. To prove that hygiene was an important part of Medieval life, there were several curtasye books available to those who wished to improve their manners. Such things as cleaning your teeth with the tablecloth and spitting at the dinner table were frowned upon. Likewise blowing your nose into your hand and NOT wiping it on your clothes afterwards. Nails should always be clean. And hands, face and teeth must be washed every single morning. Hand washing a person of highest rank was often a ritualistic affair concerning two bowls - one empty, one full of scented water - two servants and a towel. The bowl containing the warm water was placed on a sideboard covered by the empty bowl. On the arrival of the noble personage, the lid was lifted by one servant and handed to the other (known as the ewer) along with the full bowl. Said ewer - with a towel suspended from one arm - then had to kneel holding both bowls as the noble dandled his hands over the empty one. The warm water was poured, the noble washed and then had his clean hands dried by the first servant. Records from the 13th century show that hair washing was often accomplished by means of a large, shallow bowl set on a mat on the floor. The user would strip to their waist, hang their head over the bowl and then soap and rinse away to their heart's content. 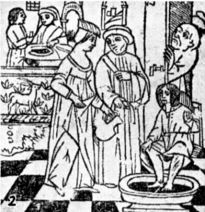 Before the advent of alcohol based toilet waters in the 14th century, our clean and well-mannered Medieval man or woman could have finished their ablutions with a dusting of powder on the face and/or the body. These were made from rice powder, ground orris root or ground calamus root and mixed with various ground spices and herbs including cloves, dried rose petals and lavender. Not only bodies were kept pleasant. Clothes and linens too were regularly sweetened. Edward IV was particularly fond of the violet smell of orris root. His linen was regularly boiled in water into which several roots tied with string were dangled. Lavender, woodruff and many other herbs were often scattered amongst stored clothes but the favourite scent came from dried roses. And the very best roses to use were those from Provence. Would it be fanciful to imagine Eleanor of Aquitaine importing these flowers from her homeland to lay amidst her velvets and silks? Castles and manor houses often smelled damp and musty. To counteract this, herbs and rushes were strewn across the floors. Lavender and thyme; meadowsweet and marjoram; germander and hyssop were all popular and if the house owner was wealthy enough - the stems and leaves of the Sweet Flag (Acorus calamus) which grew only in the Fenlands of Norfolk and Cambridge and the low-lying countries of Europe. The floors of the court of King Stephen was regularly spread with rushes and flowers so that his knights need not sit on bare flags. And Thomas à Becket ordered his hall floors covered each day with May blossom in spring and sweet scented rushes in summer. Churches too benefited from the fragrant strewing habit but all too often churchmen bent a malevolent eye on personal perfuming. Which could be construed as hypocritical when we consider that Roman worship was, and still is, a multi-sensory encounter. Eyes fed on the brilliant icons, ears were soothed by the cadences of the Latin liturgy, tongues tasted wine and wafer. Then, maybe, hands stroked the velvet or coarse wool of clothing before straying to finger those herbs and rushes spread about the wooden pews. And then the scent of rosemary or meadowsweet or violet would rise to mingle with the omnipresent odour of incense. a 'flowery mead,' bursting with fragrant wild flowers and herbs and grasses. These beautiful, wild acres were an integral part of life - used to their full for walking in, dancing on, sitting amongst. And in houses and castles where space and privacy were hard to come by, they were perfect places for lovers to share a moment or two of secluded passion. (may God forbid it), I'd feel such shame. Would you like to join our Historical Fiction and Fantasy e-mail discussion list? Please enter your email address and click Yes (only once).